Luxe Hotels Want to Sweep You off Your Feet. 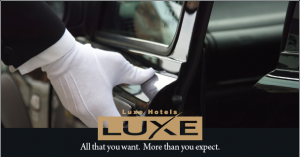 The Luxe Hotels have just launched a new signature 360˚package that provides guests with 360 degrees of VIP treatment. For $360 you’ll be treated to a personal town car pick up and drop off at LAX. You’ll also be upgraded to a luxurious room, receive a complimentary bottle of Shiraz wine, daily America breakfast, complimentary Wi-Fi, and an iPad2 to use for the duration of your stay. A two night minimum stay is required, which is discounted to $265 every night thereafter. In order to promote their luxury package Luxe Hotels is holding a contest where a lucky couple will win a chance to experience the 360˚ package by offering a complimentary stay for two at any of the three Luxe Hotels in California—the Luxe Rodeo Drive, the Luxe Sunset Boulevard, and the Luxe City Center.